A professor in the College of Arts and Sciences has received a major grant to support his ongoing work in medium-energy physics. Paul Souder, a world-renowned nuclear physicist, is using a three-year $1.2 million grant award from the U.S. Department of Energy (DOE) to study spin-dependent phenomena—broadly speaking, the manner by which nuclei affect the radioactive decay and nuclear fusion of subatomic particles. The DOE has been supporting Souder’s work since 1984, a year after he joined the Syracuse faculty. Souder is using the grant to examine weak interactions in nuclear physics. Despite its name, a “weak interaction” is stronger than gravity and is responsible for the decay of fundamental particles, such as bosons and quarks. In weak interactions, neutrons convert to protons, and electrons become electrically neutral particles called neutrinos. To better understand how these interactions work, Souder relies on a process called electron scattering, in which polarized electrons are “bounced off” atomic nuclei. These mini-collisions reveal lot about the size and charge-distribution of the particles in question. 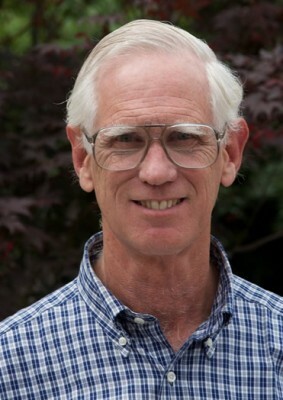 Much of Souder’s work takes place at the Thomas Jefferson National Accelerator Facility (also known as JLab), a nuclear physics research laboratory in Newport News, Va.
At JLab, Souder will use DOE funding to develop a solid-state spectrometer, useful for testing the Standard Model of particle physics and searching for charge-symmetry at the quark level. Souder will also continue work at JLab on a Møller scattering experiment, involving the mutual interaction of two electrons. “The experiment will break ground in how small an asymmetry may be measured,” he adds. Souder has received well-deserved recognition for his work. In July, he was the subject of a daylong fete at Syracuse, attended by colleagues all over the country. A day later, he co-chaired PAVI14, a weeklong international conference on modern nuclear physics that took place in his hometown of Skaneateles, N.Y. Last year, he received the Outstanding Nuclear Physicist Award from Jefferson Science Associates—one of the highest honors in his field. Souder came to Syracuse, following appointments at Harvard and Yale universities. He is a fellow of the American Physical Society and a prolific scholar, with more than a hundred articles to his credit. Souder is also an internationally sought-after speaker who earned a Ph.D. from Princeton University.